And then had Luke's first basketball game of the season! Griffin passed out late afternoon which was a welcome thing since homegirl can HANG... but she was so so so tired that afternoon! The boys were part of the MCA float in Saturday night's Christmas Parade of Lights and I'm pretty certain they were the cutest shepherds in the flock :) Mason was SO EAGER to sign up, but when we put the costume on (over several layers of clothing) and he realized I wasn't going to be on the float with him his nerves set in. Sweet boy! On the float and feeling better! Once we got the boys situated we headed to the square to meet up with friends and watch the parade. We were there early to get the boys on the float and get our normal spot secured and there was lots of time for pre-parade playing. 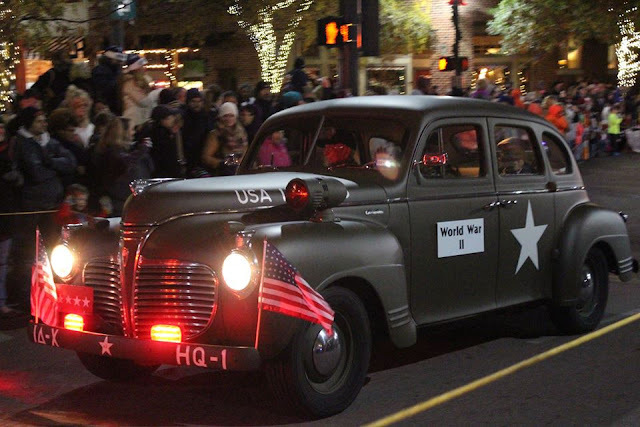 The parade is very "small town" and I think my favorite part this year were the period vehicles with veterans from those wars inside. Love an opportunity to cheer for veterans! GG working on her "parade wave"
... and then back at basketball for Mason Sunday afternoon. We left straight from basketball and took Griffin to McKinley's house for a Girls Christmas Craft Camp. She and her neighbor hosted this sweet event for neighbors sand friends and GG was BEYOND excited! When I picked GG up a few hours later she was shoeless, covered in cocoa and carrying a bag with three of the SWEETEST little crafts ever! One for mommy (peppermint scented shower tablets), one for Daddy (wooden coasters that she painted) and one for herself (an ornament with cocoa and marshmallows). SO SO SO CUTE! After craft camp we headed to the mall to pick up a few gifts I had ordered, add a few things to our lists for Gram and Papa Mac and pass out some gift cards for our FAVORITE hoodie company! Despite not feeling well it was a really great weekend. Lots of fun activities and time together. G's pre-dance pics get me every.single.time. Sometimes you have to just embrace the sonic tater tots. I love that! Glad you are feeling better! 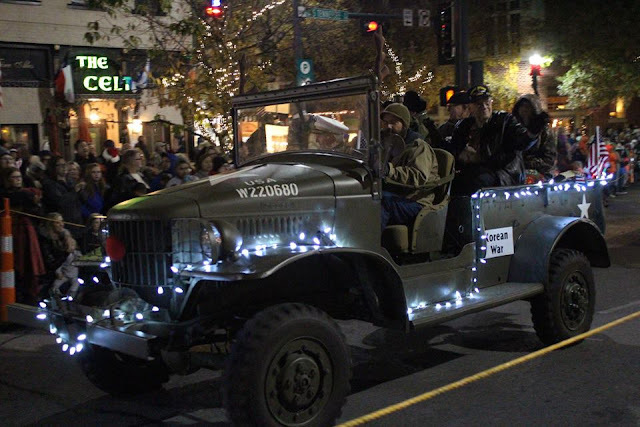 The parade was so much fun!! Loved seeing your sweet boys on the float! Sweet Mason and his nerves! Looks like a great weekend! As always, you can pack so much into a weekend. Even when feeling crummy! So glad that you are feeling better and loved all the pics. So cute! Wow what a weekend!! That parade looks awesome, and sweet little Mason was so cute! (Luke too of course!) And how fun for GG to go craft with the girls! Well your "cool" quotient just went through the roof with me! I saw in IG you were handing out the ET gift cards- how fun is that?? I'm glad you are feeling better and the weekend looked like tons of fun. Thanks for sharing! Love that parade! My cousin's son is a police officer in McKinney! Small world! He bought a house there recently. Looks like a very fun weekend! I noticed your windows and I know you had mentioned trying to maybe find curtains for them. I just recently bought a new set for our big front window and I'm completely in love with them and they are super neutral. Just wanted to share with you. Where is the momma tried v neck from? i love it. What an awesome town you live in! I loved the war veterans pics-that is such a COOL part to include in the town parade. The boys are adorable herders:)) The styling of the kids table for breakfast was so good! Thank you for the ideas. Oh yes and the Momma tried top is cute!